Moving into spring - an update from the Grey Long-Eared Bat project! As we move from winter into spring, temperatures start to rise and the countryside seems to come to life as so many species reach the end of their dormancy. At this time of year, hibernating bats start to wake from their torpor, moths will start to wake from their winter slumber, and the first signs of seedlings start to emerge from the ground. 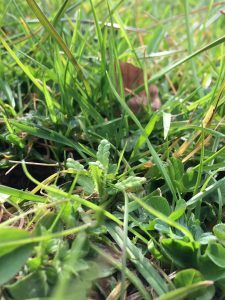 In autumn/winter 2018, we carried out our first round of wildflower seeding, taking the first steps in grassland restoration that will support a range of invertebrates that will in turn, support the grey long-eared bats. With the ground carefully prepared, we broadcast a seed mix containing over 20 species of wildflowers, including birds-foot-trefoil, black knapweed (great for pollinators) and the all-important yellow rattle. Yellow rattle (or hay rattle, as it was once common in hay meadows) is an annual, native wildflower that is great for pollinators, but is also a hemi-parasite. This fascinating plant parasitizes dominant grass species, reduces their vigour and creates opportunities for other flowering plants. This makes it a very useful tool in the creation and restoration of species-rich grassland, the favourite foraging grounds of the grey long-eared bat. 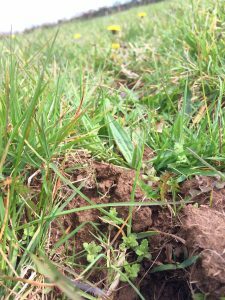 This spring, I have been out surveying our grassland restoration sites, hoping to see the successful introduction of yellow rattle – the first critical step in the slow but rewarding process of creating more wildflower meadows. For the most part, I have not been disappointed! Several sites have shown successful establishment. Along with appropriate management, this will see these sites significantly improve their value for future invertebrate populations, and secure them as good quality foraging areas for grey long-eared bats.